Superior Golf & Spa Resort welcomes families to enjoy a nice getaway! Become our guests and spend a wonderful eventful weekend together with your loved ones. Planning a private business trip, conference for colleagues, family vacation or romantic weekend? Then the five-star Superior Hotel is the ideal location for you. Only the Superior offers a magnificent combination of elegant interiors, business convenience, home comforts, and impeccable service. This boutique hotel is proud to be voted the best golf hotel in Europe 2017, the best sport hotel in Europe 2018 according to the International Hospitality Awards. 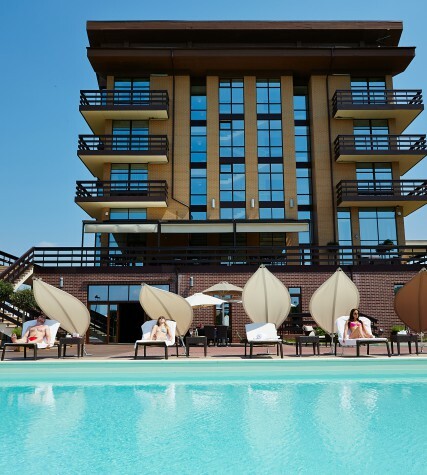 The Superior Hotel is located on the site of the Superior Golf & Spa Resort, Ukraine’s only golf resort. 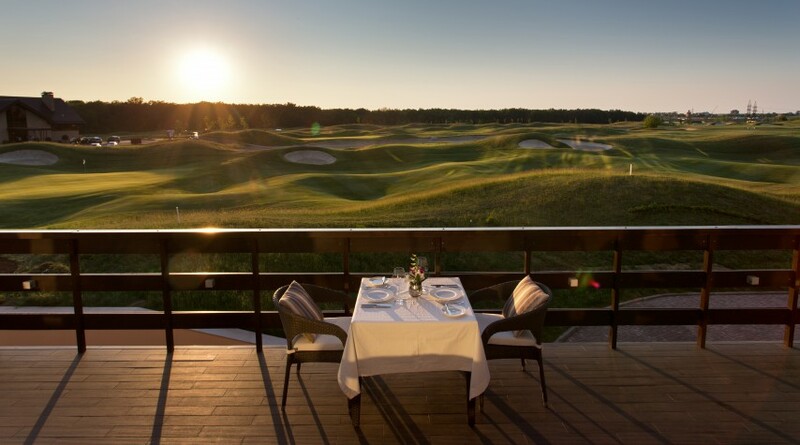 Just a 15-minute drive from the center of Kharkiv, a professional 18-hole golf course awaits you, along with a modern spa complex, multi-functional business center, universal tennis courts, restaurants with signature cuisine, and a children’s playground. The Superior Hotel opened in December 2011. The hotel building was designed by British architect John Seifert, famous for his work with the Hilton hotel chain. In the lobby, you are greeted by the hotel’s prized possession and symbol: an 18m (60ft) tall fireplace, the height of four floors of the building. The drawings on the fireplace were made using the ancient sgraffito technique, also known as “scratch painting”. This monumental décor is attributed to the Incas and Mayans, and can be seen in Europe on the walls of Renaissance-era houses, and in CIS countries on buildings from the Soviet period. Superior Hotel — 45 rooms of every category: from standard rooms to a presidential suite. We took a European approach to the design: the interiors predominately feature natural materials. Pastel tones of fabric and décor, Italian furniture and original paintings – in every room, subtle design choices are combined with functional details. The French windows open out onto a panoramic view of the picturesque woodland and golf course. If you are a fan of active vacations, our professional golf, tennis and fitness trainers will run sessions with you, develop a customized activity program, or join your game. Prefer to relax and unwind? Welcome to one of Ukraine’s best spa centers. Specialists at the Superior Spa select face and body procedures personally for you, offer individual wellness programs and the very latest products in the spa industry. Pools, a gym and the aquazone are also at your disposal (use of which is included in your room rate). If you are planning an event, three conference spaces and the Superior Hall, a multi-purpose events space for 250 people, are available to you. You can hold both private meetings and large-scale business forums here, as well as presentations, seminars, wedding receptions and concerts. Looking for something romantic? The unique three-level luxury of the Romantic Triplex was created with lovers in mind. The soft tones of the décor, light furnishings and intimate lighting immerse you in a world of tenderness: everything is there for you, and you are there for one another. If you want to organize a romantic breakfast, business lunch or family dinner, choose any of our restaurants, with their indoor spaces and open terraces. A menu awaits you that will amaze even the most sophisticated gastronomists: Ukrainian and European cuisine, signature deserts, vintage French wines, and children’s and wellness menus. We have thought through everything to the tiniest last detail – nothing will interfere with your vacation or work. Free high-speed Wi-Fi is available across the entire hotel grounds, and we have free secure parking. And if you cannot afford to spend time making long journeys, there is a certified heliport in the Superior Golf & Spa Resort grounds. The green hills of the golf resort, deciduous forest, azure lakes, wild swans, fresh air and incredible landscape are sure to make your stay with us an unforgettable one. Treat yourself or loved ones an unforgettable holiday to the five-star hotel! Play, practice, relax! Packages Golf Weekend и Golf Week.